We have a ton of hummingbirds this year. I hung a feeder outside one of our slider doors. All day long, they are drinking from the feeder. I made my own nectar. It's rather expensive in the stores, and the red dye is not good for the hummingbirds. It is quick to make your own, and cheap as well. To make your own, just put four cups of water and one cup of sugar in a saucepan. Bring to a boil for two minutes, then let cool before filling your feeder. This recipe makes more than my feeder holds, so I just put the extra in the fridge until it is time to refill. The hummingbirds are attracted to red on the feeder. If you don't have any red on your feeder, just tie a red bow on it, and they will come. 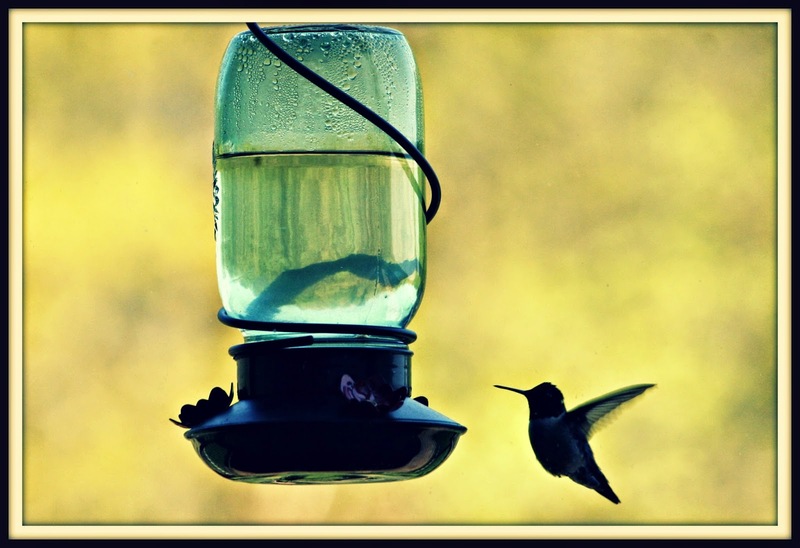 Readers, do you have any hummingbirds? Brilliant idea, and much healthier for the hummingbirds! Not seeing any yet, just getting the first orioles to the feeders this week. They usually follow each other close. I put up about 6 feeders. we have fewer here the last couple of years than we've had in years past. but i always keep a few feeders out. had to move them in closer to the house as the squirrels were destroying them hanging in the tree. I make the very same recipe and have for years. I have 3 feeders out and not one single hummer so far. They are my favorites and am sad they didnt come back to see me this year. Haven't seen any hummingbirds here yet! I wondered why they'd dye it red in stores until I kept reading and saw they're attracted to the color. I did not know that... I've seen them at a friend's house. Not here though. We've got woodpeckers...I'd trade ya, but you don't want woodpeckers. ;) They're nice to look at, smart too, but def. hard on the house. What a GLORIOUS picture!!! Yes, we have hummers. And your post makes me want to buy a feeder and make the food. I think a little trip to Wal-Mart is in order. We don't have one at this house but I use to have one. We do get a lot of hummingbirds enjoying out flowers throughout the year. I bet your family loves to watch them. How pretty! I usually don't put my feeder out until Memorial Day--I think it is still too cold here for them. I make my own food too because it is very important to keep fresh nectar available for them to eat. You have to change it often if it is in a hot, sunny spot. Wow, what a wonderful idea! I've always wanted to see a Hummingbird up front and personal. Now I so want to try your recipe and buy a feeder. Love this! thank you for the info! Nice shot! We won't get Hummers here til the end of July. Nope, none here. But, it's wonderful that you make your own for the feeder! I had a mob of them earlier this month, and now I just have one. I don't know what is going on. I don't add red dye either..just sugar and water. Maybe mine will come back soon. This wicked weather has probably scattered them. I have 3 hummer feeders out --and have seen a FEW around here --but not too many. A year or so ago, someone gave me a whole bunch of hummingbird nectar packets.. SO---I'm still using the 'red' ones --but once they are gone, I'll make my own. I haven't seen any yet. I put out a feeder and a hanging fuchsia last week. Got some clear hummingbird food from Tractor Supply. I don't think they'd like our water anyway; it smells like sulphur. We had a feeder a few years ago, but I haven't put it up since. Thank you for the reminder! I'm sure my kids would love to watch the hummingbirds! I have a family member in North Carolina who does, and during a visit, I saw the hummingbirds up close for the first time! I love the idea of adding a red bow. Your feeder is amazing. I used to make my own hummingbird food. I don't do it anymore because the bees get in it and then they fight with the hummingbirds.